Description: Take It to Your Seat Math Centers K-Grade 1, has everything you need for 12 centers to practice beginning math skills. 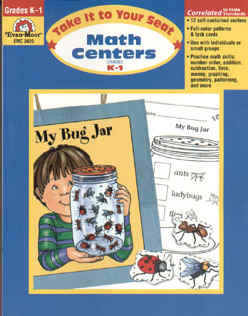 These centers, stored in colorful gift bags, are ideal for small group and individual practice. This new book comes from an independent book store in the United States. Shipped quickly and we provide a USPS tracking number. Priority and International Shipping available.